Easy to make “cheater ice cream ” recipe. This is one of my favourite recipes. I’ve been making this ice cream for over 30 years. It’s such an easy treat and your family and friends will go crazy for it. Welcome to Day 6, the final day of Ice Cream Week 2014! This year the event is hosted by myself, and Susan of The Girl in the Little Red Kitchen. We have teamed up with 25 amazing bloggers to bring you ice cream treats all week long. I hope you all threw out the scales this week. Better not to look! This recipe goes back to when I was a teenager. This is something I learned how to make from a gal I babysat for. It was one of my dad’s favourite treats, along with most family members. It’s a total cheater recipe, you use ice cream and whipped cream to make it. But you don’t need to tell your guests that! 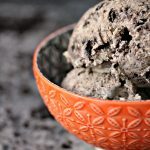 Easy to make "cheater ice cream " recipe. This is one of my favourite recipes. I've been making this ice cream for over 30 years. It's such an easy treat and your family and friends will go crazy for it. In a large bowl combine the oreo graham crumbs and the melted butter. Mix thoroughly, and then press into mini spring form pans. Tamp the crumb mixture down, the bottom of a glass works, so does the blunt end of a honey dripped. Whack it down till it packs tight. Set aside. In a stand mixer combine the ice cream and about 3/4 of the tub of cool whip. Whisk until combined. Place about 3/4 of the cookies in a ziploc bag, take a rolling pin and whack the crud out of the bag until you break the cookies into small pieces. Now toss those pieces into the mixer. And good luck with this step, if you're like me you've inhaled about half the bag of oreos by now. Mix the oreo pieces and ice cream mixture till fluffy, add the almond extract and give it another whir till it's mixed in. Now before you pour this, right into your mouth if you're anything like me, let's go grab that hot fudge sauce. Don't even try to pretend you don't hide a jar in your fridge. We all do it. Just own it so we can move on. I want you to heat the sauce, but only slightly. It should be barely warm, just loose enough to spoon out. Take this mixture, while trying to resist drinking it straight from the measuring cup, and spoon it over the oreo crumb base. Do not try to smooth it, that will create the crumbs to lift back up. Just pour the hot fudge sauce over randomly. It you want it more even, just swirl the dish around a bit. Now pour the oreo ice cream mixture over top. Smooth the tops. Place in the freezer for about 4 hours, or even overnight. 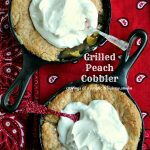 Remove from freezer and top with remaining whipped cream. Then top each one with a cookie. Serve with a big old "I'm so glad we had two bags of oreos in the house" kind of smile! Susan and I would like to thank all the participants and sponsors for joining in the fun. It’s take a village to make this much ice cream! Disclaimer: I did not receive any product for participating in this event. The #IceCreamWeek Giveaway is open to U.S. and Canada residents only. ONE winner will receive ALL the prizes listed. Giveaway ends at midnight on August 31st. Winner must be 18 years of age. Winner will have 72 hours to respond to email notification of winning, or a new winner will be drawn. Thanks for entering. Man this looks awesome, Kim! I need to scout the thrift shop for mini springform pans, because I’d be tempted to eat the whole thing and my 10 inch pan would be a wee bit much. Thanks Kirsten. I found mine at Walmart of all places. They had them on one of those hanging display racks at the end of the aisles. Love mine. But occasionally when the boys do dishes they throw out the bottoms by mistake. Drives me a bit nuts. Lol. So glad we did this event. It was a wild ride but totally worth it. I found your comment horrendous and insulting….in opposite world. I’m a traditionalist who can’t make up her mind, so I take Neopolitan (Vanilla, Chocolate, Strawberry) and mix it up. True story! I love that. Neopolitan rocks. We went out for twist cones tonight. So good. I could do cheater’s ice cream and this leaves the door open to so many possibilities. And what a giveaway! Thanks Jamie. I hate to admit how long I’ve been making this ice cream for but it’s well over 30 years. The extra whipped cream makes it so smooth, no matter how long it lasts (and it won’t) it won’t get hard like typical homemade ones. This is something my dad used to beg me to make for every holiday. I used to make huge batches and freeze them in those old red margarine tubs. Funny to think back on that. I do love vanilla, but in open to any ! 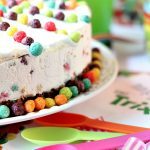 Fun dessert- Good for a birthday party! So true, we’ve made it for parties so many times. Now I need to make this. I hate you. I freaking can’t stop laughing right now. In all honesty out of all the ice creams I’ve made this thing blows the others out of the water. Something about that extra whipped cream keeps it from getting hard, it’s like cutting through butter. My favorite ice cream is coffee! Awesome giveaway! Good choice. And thanks. We had fun putting this together. lemon custard ice cream. Yum. I have an Oreo Ice Cream cake in the freezer right now. You can’t beat this for simplicity and the wow factor when served. I love it, great minds right. It’s such a great treat. Wait till you see the one in the freezer for my son’s b-day. Hopefully I can get it photographed tomorrow. Wow…what an amazing prize! I cook all my sweets from scratch because I have celiac disease so this would be a wonderful way to do that. I am so sorry about your celiac, I have IBS and barely hold on by a thread. Do you read Celiac Teen? Great recipes over there. LOVE these little cakes, but I’m not sure I’d even get to the little cake part because I think the ice cream would be gone first! Ha, it’s so true. We love this ice cream, been making it for eons. This looks amazing! Cookies and Cream is one of my favorites so this would be so dangerous around me! Thanks. Me too, I gobbled this up like a little piggie. I really need to start working out. Oy. This looks and sounds so awesome. if only mine would turn out as pretty 🙂 I really have been loving cotton candy ice cream! I don’t know what has gotten into me, I have been obsessed! You could totally do this. Those mini springform pans make it super easy. I have to try that, never had cotton candy. I may regret knowing this soon. 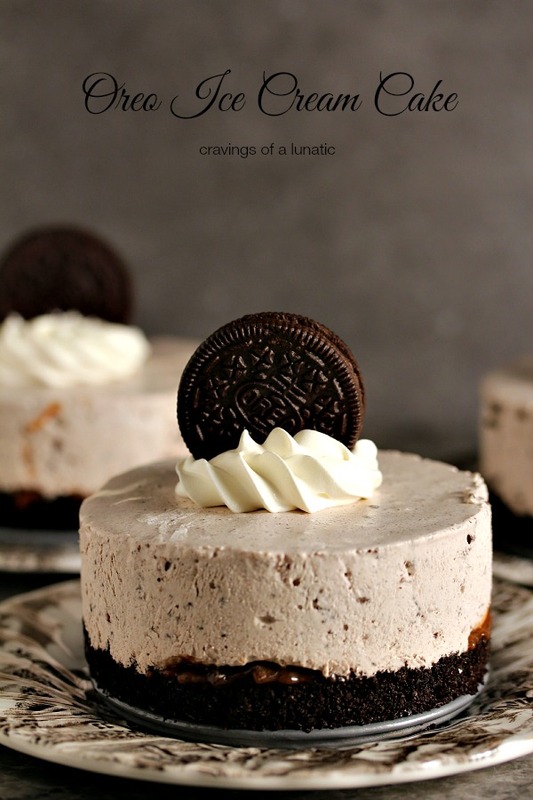 these little ice cream cakes look delicious.. definitely craving one right now, love anything oreo related! Thanks so much. I’m like you, oreo is the bomb. Can I please have a big bite. A big piece. The whole cake. See how it escalates? Ha, dying laughing right now. Made my whole day. 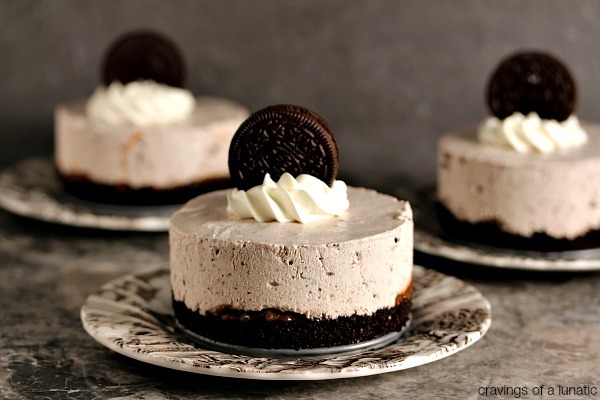 Given that cookies and cream ice cream is one of my favs I know I would just devour these cakes. I can see why this is one of your go to recipes. Thanks Emily. I just love this dessert. It’s so good. The extra whipped cream keeps it soft and easy to eat. I can never get enough of this one. Wow they look so perfect! Vanilla is my favorite, then I can put different topping on! Good to keep your options open. Smart. Oh my, what a gorgeous looking ice cream cake!! Pass me a fork/spoon or anything I want to dig in!! Thanks again for hosting such a fun week and for all the hard work you always put into these events!! Thanks so much Tara. I’m so glad you joined us. Was not uneventful but was so much fun. Kim, this ice cream pie looks amazing! I love Oreo cookies in my ice cream. Your photos are gorgeous! This looks so good! It would be the perfect birthday cake for me! I can never pass on anything with Oreo Cookies in it and ice cream! These look amazing! Thanks so much Serena. I feel the same way about anything oreo related. 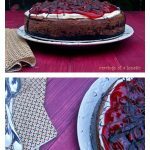 Cheater recipe or no-this cake is impressive! so pretty and SO tasty! No wonder it’s a fave! Thanks so much Kayle. I love this recipe. It’s as old as dirt. Let’s hear it for cheater ice cream. Also let’s hear it for that pink lemonade ice cream pie. Oh my goodness that was gorgeous. Sooooo pink. Soooooo girly. Sooooo good that even the males would eat the girly pie. Ha! 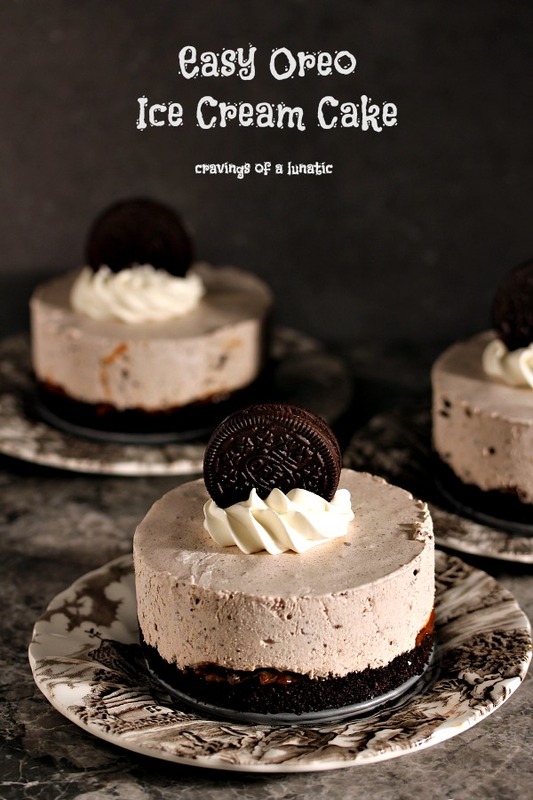 Aww loving these darling Oreo ice cream cakes! Single serve is the best idea. They are awesome! Thanks so much Jessica. I love small bites, something about individual portions just makes me happy. French Vanilla! It goes with everything! It really does. Classic choice. Another winner! 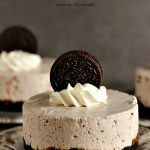 Oreos, ice cream… whipped cream… yeah… you have me at hello here! What is ‘Oreo graham’ crumbs? I am trying to make this for Thanksgiving today and do not have springform pans so I will do large cake. Where I am lost is the 2L for the ice cream and the 1 L for cool whip. Does this mean litre??? or Large???? Most all of the recipe is in tbls. or cup measurements so I do not want to get the ice cream/whipping cream measurement wrong. I will have to wing it today for Thanksgiving but will make again in January for my Bunco party with springforms I ordered online. I am assuming you mean litre? If not could you let me know. I know the conversation is around 4.22 cups to a litre. I know you are also in Canada, so I am guessing litre. Thank you, can hardly wait to try it. So sorry Robin, I just say this. I’ve been so busy lately, which is not typical of me. I usually respond quickly. Never hesitate to email if I miss comments. You can always reach mee at cravingsofalunatic@gmail.com. Email any time. L is for litre, I’m Canadian so a lot of our stuff is in litres. I may add a link in each post to help with conversions for people overseas. Might be super helpful. That being said this recipe is hard to mess up. Even if the measurements are off it’ll still taste awesome. Thanks for bringing this to my attention though. It helps me make sure I’m writing the recipes so people can convert as needed. p.s. to my original, I meant to say conversion. Also, I could not find oreo crumbs so I substituted two oreo pie crusts. Any cookie will do. I use chocolate wafers often. Also just a good old chocolate chip cookie will do. If all else fails just use graham crackers. Works like a charm. How did it turn out? I’m so sorry I missed your earlier comment. Hi Kim, thank you so much for responding. I was not sure so I used to cartons of vanilla ice cream and 1 8oz container of cool whip and it was way tooooooooo much for my stand mixer. I had so much left over as I used two oreo pie crust shells. I finally received my 12 mini springform pans and will try again in January for my Bunco party. I still cannot get oreo cookie crumbs where I am and have put in a message to Nabisco. I did research online and it just shows using regular oreo cookies (even with the white center) and crushing them and adding butter to make the crust. I will try that. Even though my measurements were off, the tast was still great. I can hardly wait to make them in the springform pans for my party as they look so cute. Hello Kim! This cake looks totally scrumptious. How many people does this feed? What size springform pan should I use? would the quantities work in a 9×11 glass pan or 2 large spring form pans? i have a family bbq saturday and would like to make this in the larger form. i guess i will buy double the ingredients just in case. Hi Sharon. Just saw this. It got stuck in the wrong place, sorry about that. Did you end up making this? Hi 🙂 didn’t you use to have a link to a got homemade hot fudge sauce? Hi Kristine. It must have become a broken link. So weird. I’ll update things this weekend but for now try this one, I think it’s the one you’re looking for. Thanks for letting me know it went missing. I’ll swing back to fix it this weekend. I appreciate it.